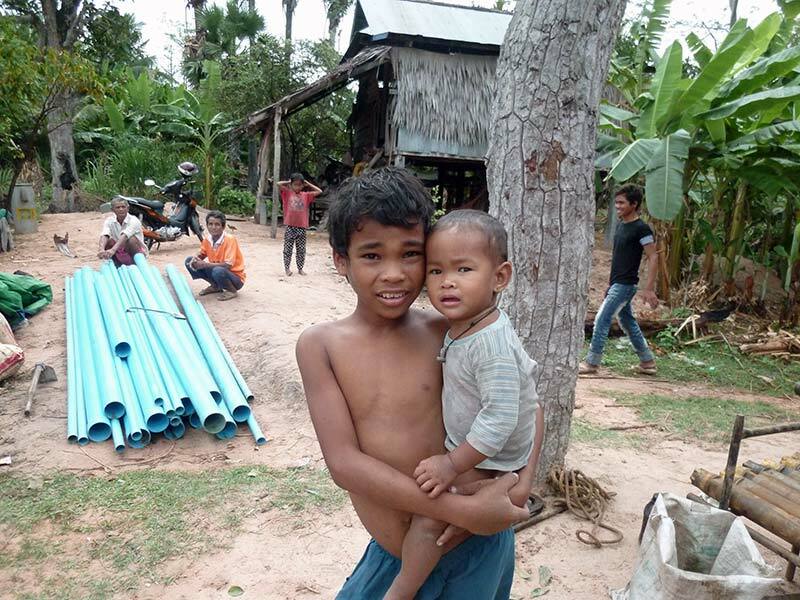 Villages benefitting from the project are all situated in the Puok district, in the province of Siem Reap. The district includes 154 villages. The population of the Province is 896,309 inhabitants, spread among 915 villages. All are situated between 20 and 45 kilometers from the city of Siem Reap, in the northwest of Cambodia. Villages are distant from each other, and present very different types of habitat. The project targets populations considered to be the most vulnerable, according to established community-selection criteria: – Date the community was established: displaced groups resettled within the last 10 years. – Family status: large families with young children, widowed, handicapped. – Degree of isolation: market over an hour’s walk away, roads inundated during the rainy season. – Habitations: construction using light materials like bamboo, palm leaves and other vegetal fibers. – Agricultural activity: land surface covered with rice fields smaller than 1 hectare. – Lack of scooters or bicycles. Conducted by qualified personnel from WAF (Water-for-All) in collaborations with village chiefs and communal Committees. 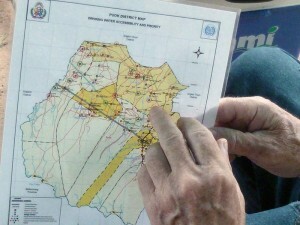 The goal is to determine target villages for the project: – Count the houses. – Record the presence (or not) of latrines. – Evaluate present family resources of raw and drinkable water. – Evaluate inhabitants’ priorities (distance covered to obtain water). – Determine methods for storing water. – Pinpoint areas prone to flooding, impractical during the rainy season. – Take into consideration the distance to sites frequented by community members (small markets, pagodas, health centers, schools, town halls). – Evaluate means of transport: bicycle, scooter, motorcycle, water-buffalo cart. – Identify isolated and/or handicapped persons. – Determine locations for installations (after technical authorization from a Water-for-All engineer). Healthcare available to the local population is limited, due to an insufficient number of health centers, the lack of equipment and medical supplies, transportation problems for the sick or injured, and the lack of qualified personnel. The number of classes is insufficient, and the general level of learning is low. Some villages have no school building, forcing children to walk long distances, sometimes many kilometers, to reach the nearest school. A lack of teachers requires courses to be divided into two daily sessions, one in the morning, the other in the afternoon. Roads are underdeveloped and in very bad condition. Wooden bridges are fragile, and often collapse during the rainy season. Roads are not paved, which makes them impractical for months each year. No national or rural electric grid exists. Villagers who have the means use generators, linked to a number of households. But most people use batteries, which can be recharged locally. The Major Problem of Puok District: Water. 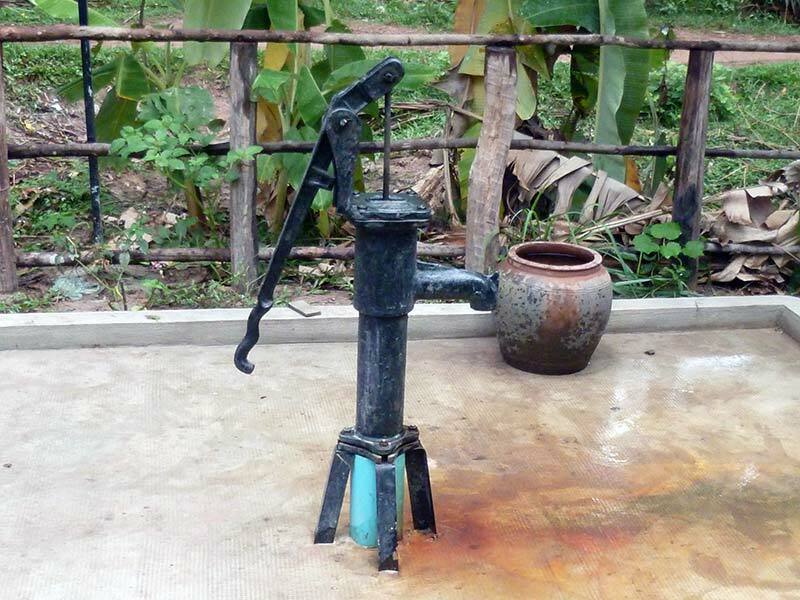 In all the villages in the district, water resources are of limited availability in terms of quantity – except during the rainy season – and in terms of quality. The number of sources of drinking water is notoriously insufficient. At the present time, it’s estimated that only 12% of people’s needs in rural areas are being met. For their daily needs, villagers use water from traditional wells, waterholes, ponds and rivers: water that is unfit for human consumption. The majority of water sources are not protected against surface pollution, and are regularly contaminated by run-off. During the dry season, most sources disappear, and villagers are forced to find water elsewhere, sometimes kilometers away. The lack of water affects people’s need for drinking water, as well as for personal hygiene, domestic needs (washing clothes, dishes, etc.) and watering animals. Cambodia is primarily composed of an immense low-lying sedimentary plain, partially submerged in the center by the waters of great Lake Tonlé Sap. The plain is bordered by a series of mountain ranges to the north and east. The district of Puok is situated in the lower part of the plain. It is characterized by tropical vegetation, pushing through the surface of the thin block of hard sandstone or granite it rests on. The climactic conditions of Cambodia, combined with the geological context of the region, results in flood situations during the rainy season, and drought situations in the hot, dry season. It’s a paradox with an explanation. What happens is that during the monsoon season, the generally shallow ground is quickly saturated with falling rain, which the base can hardly absorb. When the rains of the monsoons stop, the upper layer of ground dries out rapidly, through infiltration and evaporation: the little water it was able to store is soon depleted. 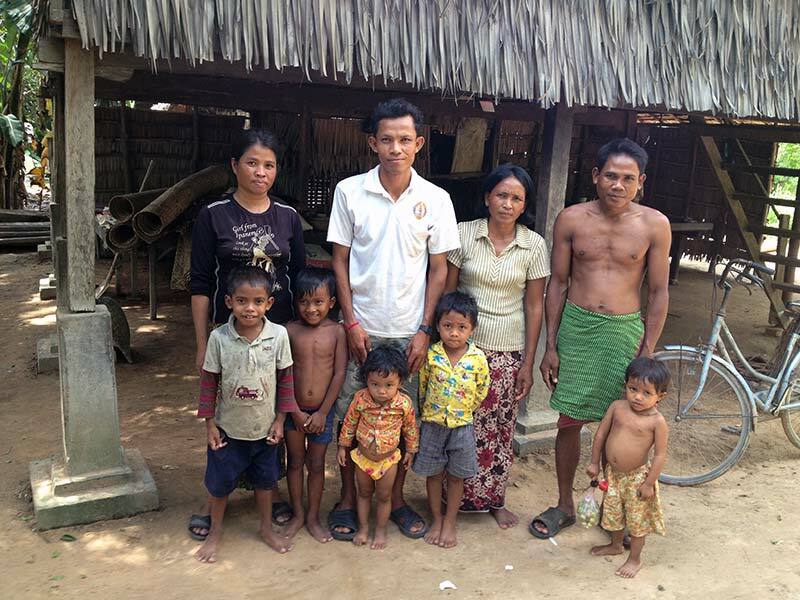 Temperatures in the dry season often exceed 40 degrees Centigrade!… As a consequence, the number of permanent water sources in the Puok district is very limited. Traditional digging procedures and manual restoration of wells eventually run up against strata of clay, and rarely profit from water stored in the upper layers. As such, most water sources are dry a few weeks after the end of the rainy season: this is the period when the demand for water is most critical. Some minor work is undertaken by local artisans who manually bore into the ground, using small-diameter tubing, and not to any great depth. The wells usually become obstructed after a few months of service, with no possibility of being restored. Present sources of pumped water are of low capacity, not permanent, and do not produce drinkable water. The lack of maintenance leads inhabitants to abandon them altogether. [G1] . Particularly concerned are the village children, the group most vulnerable to water-borne diseases. An instructor under the direction of the project coordinator informs villagers, especially women, about hygiene and the proper uses of clean water. This intervention is carried out at all work sites, through the dissemination of information and interactive discussions. Instructors perform the activity on site, for the duration of each project. The aim is to emphasize the link between clean drinking water, good hygiene, and health. Beyond that, making people more sensitive to water is an incitement to preserve their natural environment (minimize logging, encourage reforestation, collect and destroy garbage, maintain clean spaces between habitations, construct latrines, designate areas for animals, etc.). The local presence of a WATER-FOR-ALL NGO representative assures continuity of the work being done. Two villagers per installation are trained to maintain and repair the pump by an NGO technician. A tool-kit and set of replacement parts are left with those responsible, along with a plan of the pump’s assembly. This training enables the locals to do the necessary maintenance and repair work themselves. At the same time, a roaming technician is always available to ensure the proper functioning of all installations, with preventive upkeep through regular visits. Drilling equipment with Rotary procedure and MFT compressed air percussion. Drilling Materials: Drill type PAT 301 hydraulic motor. Air compressor. MFT Hammer. Drill type PAT201. Motorized pump. Mud pump. Cistern trailer. Extension tubing and associated equipment. Electric current. Diverse Materials: Masonry equipment and handling. Two transport trucks. Two liaison vehicles. 4 all-purpose scooters. Equipment and materials are stored in a workshop equipped with a mechanical loader. Human Resources: Project engineer (volunteer). Coordinator. Investigator – animator. Roaming maintenance representative. Drill foreman (on-site work management). 5 drilling technicians. 2 masons. Volunteers from the villages take care of the handling and warehousing of materials, and other odd jobs: excavation, transporting materials, preliminary groundwork, preparing meals for workers, etc. Sanitary Impact Access to clean drinking water represents important progress in terms of health. – Clean water for drinking and use in the kitchen results in a very significant reduction of diarrhea-like illnesses, especially those affecting young children. – Body hygiene and washing clothes in an abundance of pure water are important factors in the reduction of dermatological diseases. – Fatigue and pain resulting from the transport of water over long distances, mainly by women, is significantly reduced. – An abundance of water results in real progress in maintaining habitations. Social Impact Most tasks that have to do with water, like well-digging, transportation and storage, which are generally incumbent on women, are significantly reduced and/or made easier. The time saved by not having to transport water over long distances enables women to diversify their activities. Pumps in production can be used to irrigate the perimeters of small food-crop plots, and provide water for domestic animals. Food-crops and the raising of animals are essential for the local diet, and also provide a not insignificant source of income. Water Distribution Access to water is free and open to all villagers, without discrimination. Local populations are largely involved in the implementation of the project, and must The gift of water is the gift of life !